If you’ve ever thought of being your own boss with no pressure, and love creating with paper, stamps and ink, then Stampin’ Up! is for you. For the first time, Stampin’ Up! is offering two options to join. Option 1 – cost is $99 and you get to choose $175 worth of product of your choice. 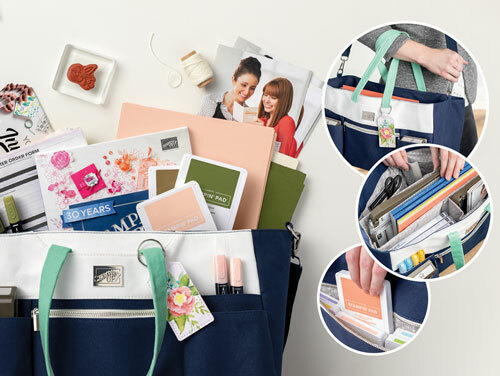 Option 2 – cost is $129, and you still get $175 worth of product of your choice AND the Craft & Carry Tote shown above. View the 2019-2020 Annual Catalog in April and pre-order from it in May prior to its launch date in June. In the 3rd quarter, view the Holiday Catalog and preorder from that too. No pressure ever to remain active. Yes, there is a quarterly quota of $300. However, when you join, that quarter doesn’t count, so you don’t need to meet the $300 quota until June 30th. AND don’t forget, when you join during Sale-A-Bration, you get $50 more product of your choice in your starter kit. This deal expires March 31, 2019. After that date, it will still be $99, but you can only select $125 worth of product of your choice. Again, there’s never any pressure to remain active. If you decide it’s not for you, you can drop out and become my customer again. The decision is all yours! Folks, this deal is a no brainer!!! Why not hop onboard and take advantage of this awesome deal before it runs out even if it’s just to get the Craft & Carry Tote with $175 worth of product of you’re choice. If you have questions, feel free to contact me through email at [email protected] or by phone at 978-609-1490.